Royal Wheels India is an adventure travel group organising Kaziranga National Park Tour Package in India. Area : 688 sq. km/ 42,996 hectares. 1974 as a national park. Kaziranga National Park lies to the south of the mighty Brahmaputra river and being on the floodplains is inundated heavily by the monsoon rains. The predominant vegetation is a mixture of tall grasslands and riverine forests. There are many marshes, interconnecting streams and ox-bow lakes, known locally as 'bheels' or 'bils'. To the south of the park lie the Mikir Hills which rise to over 1,000 metres elevation. Kaziranga wildlife sanctuary is famous for its Indian Rhinoceros population which is estimated at 1,100 + and is by far the best place to see them in India. (this species in unique to the subcontinent, with the second largest population of 400+ found in Chitwan, Nepal). Other large mammals include the Water Buffalo, Swamp Deer and Gangetic Dolphin. The park may be explored by riding elephant or 4-wheel drive motor vehicles. There are several watch towers. The nearby Panbari Reserve Forest is the best place to see the Hoolock Gibbon. Kaziranga national park has a rich birdlife. There is a colony of Spot-billed pelicans and the rare Bengal Floricans inhabit the grasslands. This area is also known for the famous Assam tea and during the winter and spring it is worthwhile visiting the nearby tea plantations to see tea leaves being picked and processed. Drive to the park from Guwahati (219 km, 6 hours) or Jorhat (96 km, 2 hours) airport accessible by flights from Delhi and Calcutta respectively. The nearest railway station is Jakhalabandha ( 43 km). 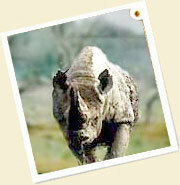 There are many places which can be visited while you are staying at Kaziranga. The Kakochang waterfalls is 13 kms from Bokakhat. Not far from the park are the ruins of the ancient Numaligarh. These ruins are of great archaeological importance. The tea gardens of Hathkhuli, Methoni, Difalu, Behora Borchapori are also other local attractions. Also visit the coffee and rubber plantations behind the tourist lodge. The park can be visited on an Elephant back or in a Jeep. There are trips covering Mihimukh, Baguri, Hole path, Arimarah, Kohora Central path-Baguri all areas teeming with wildlife-all authentically wild. The Aranya Forest Lodge and two tourist lodges run by the Assam government are 3 km from the park entrance at Mihimukh. The Wild Grass Lodge is located a little further. Riding elephants are available at the Mihimukh entrance. With an accommodation of 21 rooms, Wild Grass Lodge is a private modern resort. It is situated by a stream in the paddy fields and forest. 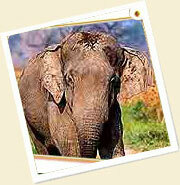 The lodge has the facility of arranging elephant rides and walks through the forest and tea plantations. There is wide range of accommodation facility at the park. There are rest houses, dormitory and lodges maintained by the forest department and the ITDC. The forest department has two rest houses and one dormitory. ITDC has three lodges, one dormitory and two cottages. The lodges have A/C and non A/C rooms furnished with modern accessories. Day 01 : Fly to Guwahati. Upon arrival in Guwahati, met & transferred to Kaziranga (250 km - 07 hrs driving time approx.). Later, check-in to your hotel Wild Grass resort for five nights. Overnight at the resort. Day 02-05 : Enjoy your morning and afternoon game drives along with an elephant ride in the Kaziranga National Park. Overnight at the resort. Day 06 : Morning depart by surface to Guwahati airport. Fly to Delhi/ Calcutta. Arrive Delhi/ Calcutta. Transfer to a hotel for day use. Later in the evening transfer to the International airport to connect your flight for your onward destination. Morning guided tour of old Delhi covering Red Fort, Jama Masjid, Raj Ghat etc. After lunch go for shopping or additional sight-seeing. Overnight in the hotel. Drive to Guwahati to connect flight to Bagdogra at noon. Arrive Bagdogra and drive to Kalimpong. Overnight in Hotel Himalaya or similar.